There is often disappointment when, a few weeks after having a new lawn installed, it no longer resembles the beautiful appearance of when it was first laid. But there are steps you can take to ensure your new lawn’s health and peak performance. Firstly, you need to remember it is normal for your lawn to lose condition in the 1st few weeks — it is part of the “grow in” process. It is in shock from being chopped out, rolled up (in some cases in severe heat), thrown in a stack on a pallet and trucked through the metropolitan area to your place. It may have been on the truck (cut the day before and loaded) for 12 hrs or more. 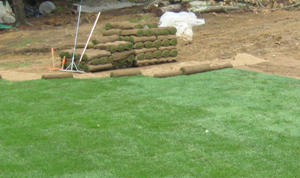 The fact is, a reputable turf farm really knows how to grow a great lawn — that’s their business. They grow it rapidly, cut it a lot, stimulate rapid growth with nutrients and plenty of water, courtesy of an efficient bore water system and, in some cases, some pretty generous water allocations. Secondly, there are things you can do to help your lawn ‘grow in’. So read on…..
Generally my advice is to try and get your lawn planted in the Spring so it is established long before the Xmas break. a. When measuring the area to be replaced/replanted, add 15% to your turf order as you tend to use extra rolls with cutting along kerbs, garden curves etc. c. Have you taken into account shaded areas, especially areas backing onto shade-inducing structures on the northern boundary? When planning a lawn area it’s a good idea to cast your mind forward to Winter, when the sun is lower in the northern sky. How much shade is there from structures? How much shade from deciduous trees when carrying a full leaf canopy? How much sunlight will it receive? In my experience you need a lawn to receive at least 60% of available light/sun during an average Winter day. 3-4 hours of sunlight in the morning or afternoon just won’t cut it, Winter after Winter. I have a saying that there isn’t really a warm season variety of lawn that actively tolerates shade; just some varieties that take longer to die. You can alleviate shade problems by a higher cut level, minimising foot traffic, and a structured consistent nutrition program going into the cooler months. Please note, a higher cut level is different to just not cutting your lawn. Some people get the mower out after 6-8 weeks and slaughter the leaf off. This retards photosynthesis and the plant goes downhill from there. Yes it’s true, cutting frequencies can get out to 3-4 weeks in cooler months but consistency is the key. d. Know your sprinkler type, precipitation rate. There are a few different sprinkler options out there. Pop–up, gear driven, MP Rotator style. They all have their good points, but what do you need? Is your location windy? Need a heavier droplet? Proper amounts of water in the 1st 2-3 weeks is vital. Under no circumstances should the canopy dry out. The soil profile should be wet through to a depth of at least 80mm (this is the depth you want your grass roots to get to quickly) at least twice per day. If you encounter 30 degree plus weather in the 1st 20 days you may find your lawn needs a lunchtime water. 40mm of water per day as a minimum must be applied. e. Timing of the 1st cut. This is vital. By about day 20 after planting, the lawn will be producing soft succulent leaves feeding on the water and pre-plant nutrient-rich aggregate. Cut at a height to just nip the top 30-40% of the leaf off. This is just an introduction to cutting. The next cut a fortnight later can be a bit lower but still nothing too drastic. The catcher must be fitted to the mower and all clip removed. f. Be vigilant, and keep an eye on things. Peak growing conditions can also breed a few other problems (for example, insects, fungal issues). If confused, phone a professional so we can check things such as water, root infiltration, and nutrient requirements. That way, you can nip problems in the bud before a bigger, more costly problem occurs. The Lawncare Man offers not just lawn repairs/installation but a grow-in service supervising the grow-in stage (first 4-6 weeks of your new lawn and completing the 1st cut for you). A new lawn should be money well spent and provide either an active outdoor area or a retreat and passive paradise for just you or all the family to enjoy. We take the guess/stress work out of it.